Drunken Andrew Emery has been jailed after he made public posts on Facebook calling for ‘mosques to be burned’ in the aftermath of the Manchester bombing. The 45-year-old dad ‘let his fingers run away with him’ on the day of the One Love tribute concert organised by singer Ariana Grande last summer. He posted, ‘It is time we started to fight back. The Government won’t do **** because of the PC brigade. Every time we have a terrorist attack we should burn a mosque’. Three hours later he posted, ‘To all the British murderers and serial killers out there, do us all a favour and concentrate on the Muslim community’. A further post read, ‘Burn a mosque today and feel better’. His posts could be read by the wider public and he was arrested after a complaint was made to Humberside Police. Now Emery has been jailed for two years at Stoke-on-Trent Crown Court. Prosecutor Harpreet Sandhu said the comments came on June 4 last year, the day of a tribute concert following the Manchester MEN Arena bombing on May 22 in which 22 concert-goers were killed. Mr Sandhu said: “The defendant posted, ‘It is time we started to fight back. The Government won’t do **** because of the PC brigade. Every time we have a terrorist attack we should burn a mosque, preferably when it is full’. “Three hours later the defendant posted, ‘To all the British murderers and serial killers out there, ‘Do us all a favour and concentrate on the Muslim community’. Mr Sandhu said the defendant’s posts were not confined to his 157 Facebook friends and could be seen by the wider public. The posts led to a member of the public contacting Humberside Police on June 4. Mr Sandhu added that the posts were not isolated and Emery had made comments on previous dates including, ‘Trump had the right idea trying to stop Muslims entering his country. Maybe we should do it so we would only have to worry about the scum already here’. The defendant told police he had posted ‘stupid comments’ on Facebook. He added he was not a racist. 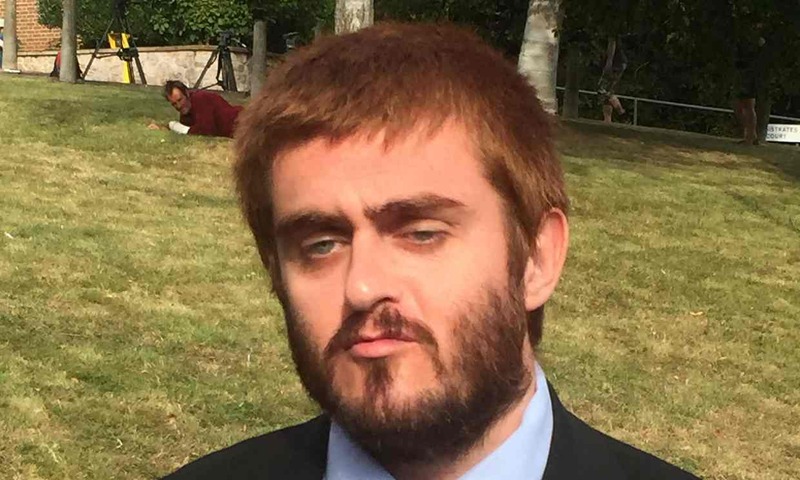 Emery, of Aylesbury Road, Bentilee, pleaded guilty to three charges of publishing or distributing written material intending to stir up religious hatred. Brian Williams, mitigating, conceded the defendant’s comments were ‘abhorrent’. He said Emery is a hard-working family man and has a teenage daughter who is an Ariana Grande fan. Mr Williams said: “She wanted to go to the concert but they could not afford to send her. “At the time he drank too much and his father had just been diagnosed as terminally ill. These offences post date the terrible explosion in Manchester and there was the added factor his daughter could have been there. “Without thinking rationally he allowed these appalling comments to pour out. He would not have gone in a pub or stood on a street corner and said such things. Recorder John Butterfield QC told Emery his posts did a great disservice to those injured and killed in the arena bombing. He said the defendant’s previous posts demonstrated that the three charges he pleaded guilty to were not isolated or uncharacteristic. Recorder Butterfield QC said the offences were aggravated by the fact the posts advocated fatal violence, they were widely available to the public and they occurred at such a sensitive time. 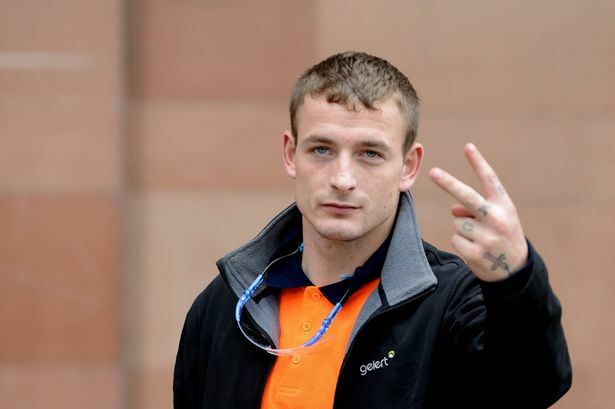 Andrew Jenkinson hurled racist slurs and described black people as “monkeys” before he attacked Dominic O’Hara in Edinburgh. 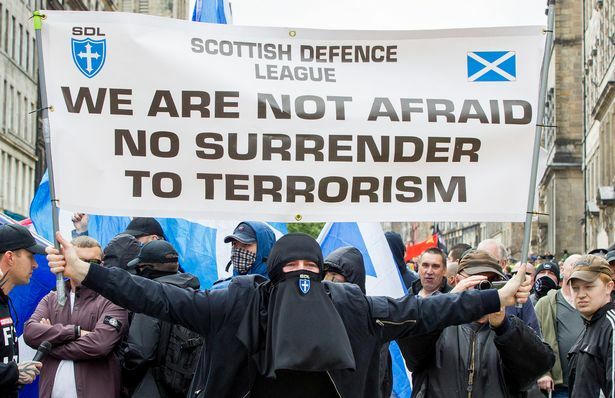 A Scottish Defence League supporter has been found guilty of hurling racist abuse and assaulting an anti-fascist activist handing out leaflets at a Fight Racism stall near The Mosque Kitchen in Edinburgh. 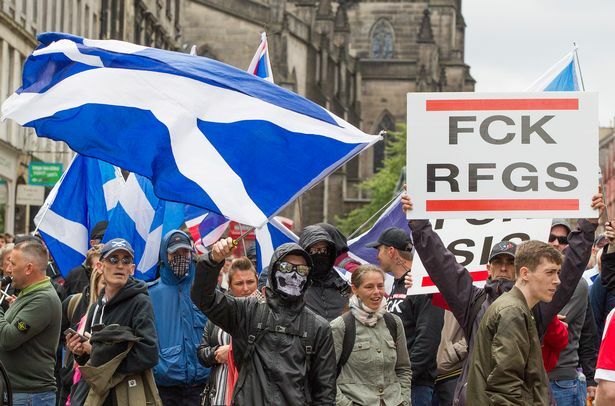 Andrew Jenkinson, 41, of Edinburgh, was told by a Sheriff that his actions had been “deeply offensive and an unprovoked attack on freedom of speech”. He was found guilty at the city’s Sheriff Court today of behaving in a threatening or abusive manner, shouting, swearing and making and uttering grossly offensive remarks and gestures in Nicolson Street on September 21 last year. He was also found guilty of assaulting Dominic O’Hara, 27, by kicking him on the body and punching him on the head. O’Hara was at the stall with friends handing out leaflets when Jenkinson approached in a aggressive manner and described black people as “monkeys”. “He said he didn’t like our literature and banners and was really het up” said O’Hara. “It looked as though he was going to headbutt me and asked me ‘to come round the corner’. “Obviously he wanted to fight, but didn’t want it on the public street”. According to O’Hara, Jenkinson was shouting about the SDL saying: “We will hunt people like you down. You love Islamists”. O’Hara said a woman tried to reason with Jenkinson, but he called her “a pig”. Sheriff O’Grady asked if the woman was white or black and was told she was black. O’Hara said he stepped between Jenkinson and the woman, with his back to Jenkinson, to try and defuse the situation. He was then kicked on the ankle and when he turned round was punched three times on the face. He then tripped Jenkinson up and they fell to the ground. When they separated, he said, Jenkinson walked off “expressing fascist views and making the Nazi salute”. Questioned by Jenkinson’s defence lawyer, Elaine Clancy, O’Hara admitted he had previous convictions for obstruction, during a student protest, breach of the peace with a loudspeaker and assault. He denied he had “a vendetta against Mr Jenkinson”. Twenty-nine year old Ruby Barrowman, who had been at the stall with O’Hara, said Jenkinson had told the South African black woman, who was with her daughter, to “Go home”. He called her and O’Hara “Anti-white racists” and shouted about the SDL. 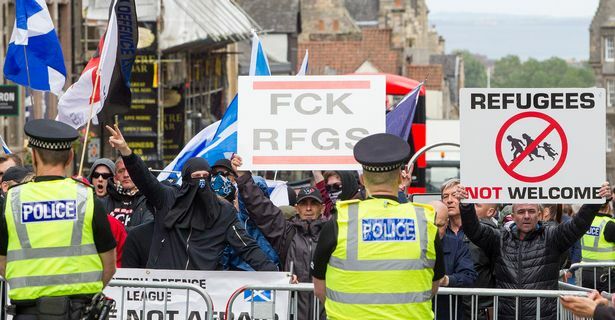 Asked what the SDL was, she replied: “They are fascists”. Jenkinson said he had dropped his father off at Surgeon’s Hall and had gone to get money from a cash machine. The “Fight Racism” stall was near the machine, he said, and displayed flags, banners and collection tins. He said he asked if they had a licence from the Council to do this. He admitted to having “a heated debate” with the South African woman with the young girl. Things escalated, he said, when he was called a “Nazi” and “fascist”. He told them this was Great Britain and he was “a proud patriot of my country”. He admitted pushing O’Hara, but denied any punching and claimed O’Hara had gouged his eye. He said he had never given a Nazi salute or said anything about Islamists. He told Fiscal Depute, Claire Crompton, the Fight Racism campaigners were “anti-British, pro-IRA and Revolutionary Communists”. He denied being a racist, saying a Chinese friend of his had committed suicide because of racist abuse. 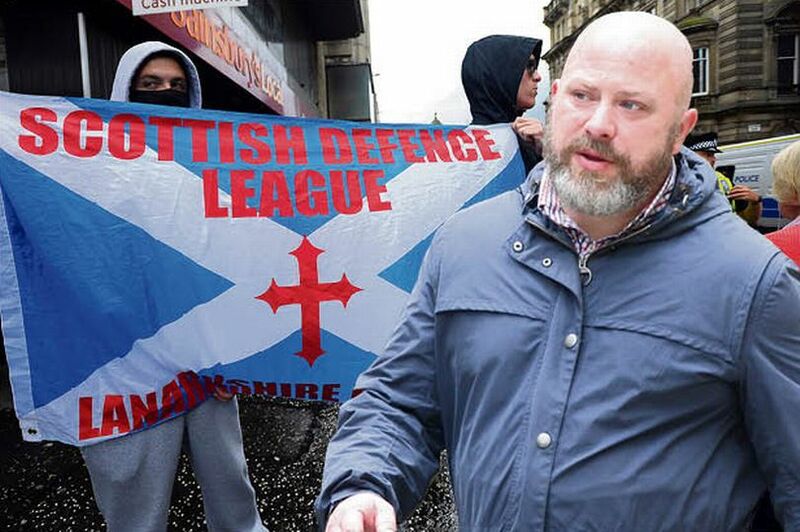 He told Sheriff O’Grady that shortly after the incident, pictures of himself and his children had been posted online and that it was claimed he was a member of the SDL. He denied this but admitted: “It’s possible it may have mentioned I had been at some demos”. Finding Jenkinson guilty , Sheriff O’Grady told him he regarded the evidence of O’Hara and Barrowman as credible and reliable and had no hesitation in accepting it, and had no hesitation in finding him guilty”. Sentence was deferred until next month for a background report. 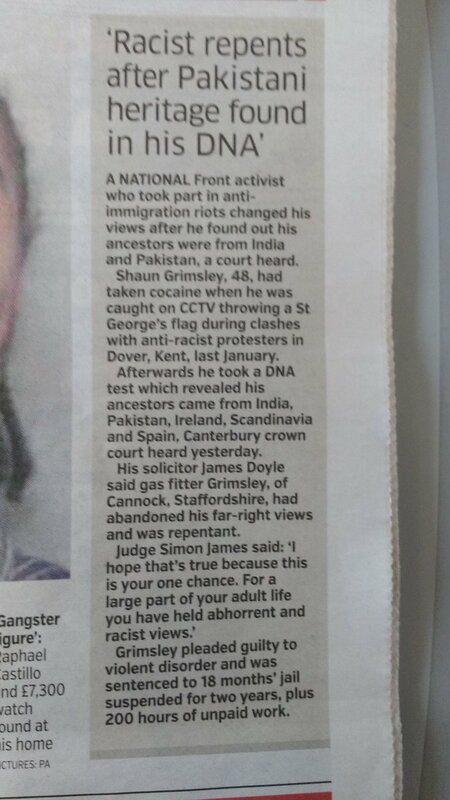 A National Front activist who took part in anti-immigration riots changed his views after he found out his ancestors were from India and Pakistan, a court heard. 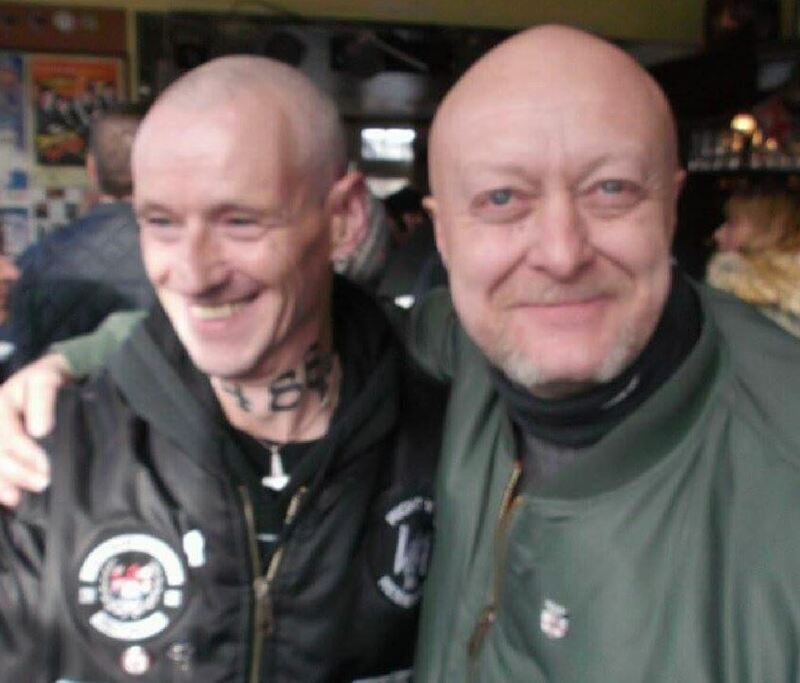 Shaun Grimsley, 48, had taken cocaine when he was caught on CCTV throwing a St George’s flag during clashes with anti-racist protesters in Dover, Kent, last January. Afterward he took a DNA test which revealed his ancestors came from India, Pakistan, Ireland, Scandinavia and Spain, Canterbury crown court heard yesterday. His solicitor James Doyle said gas fitter Grimsley of Cannock, Staffordshire, had abandoned his far-right views and was repentant. Grimsley pleaded guilty to violent disorder and was sentenced to 18 months’ jail suspended for two years, plus 200 hours of unpaid work. A patient posted shocking racist abuse on Facebook about a nurse who was looking after him following an overdose. Kieron Wright had been admitted to Sunderland Royal Hospital after taking an overdose, the Chronicle Live reports . He referred to her as a “big ape-looking lass” and added: “Not ******* happy. The deputy head of corporate affairs at the local NHS Trust became aware of what he had written on Facebook during his stay. A man who sent a threatening voice message to senior Labour MP Ben Bradshaw the day before the killing of parliamentary colleague Jo Cox has been given a suspended sentence. In the two-minute message Geoffrey Farquharson, 37, shouts down the phone, swears repeatedly and makes threats towards the former culture secretary. The racist and homophobic message, which was left on the answerphone of Bradshaw’s parliamentary office, was sent the day before Labour MP Cox was killed in June this year. The message made Bradshaw fearful for the safety of his staff, Exeter magistrates court heard. District Judge Stephen Nichols sentenced Farquharson to 12 weeks’ imprisonment, suspended for two years. He was also given a 25-day community order, banned indefinitely from contacting Bradshaw or attending his constituency office, and ordered to pay £85 prosecution costs. The judge told him: “The message was clearly homophobic, Islamophobic and racist and there was clearly a death threat to Mr Bradshaw. 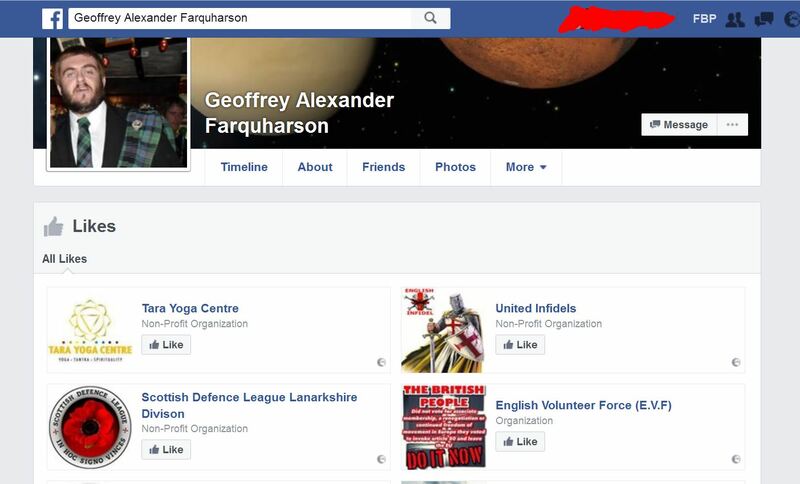 In the message, which was played to the court, Farquharson starts by giving his full name and address and says he has just watched a video on Facebook about Muslim extremism. Farquharson then launches a homophobic tirade against Bradshaw, who is gay, and repeatedly goads the MP to call the police. The defendant uses highly offensive language throughout, and describes Bradshaw as “evil”. The call was picked up by a member of the MP’s staff, who raised the alarm. After Bradshaw reported the matter to the police, Farquharson was arrested the following day. He went on to say that public servants should not have to put up with threats and abuse from members of the public and that his concerns had been heightened because of the killing of Cox. At a previous hearing, Farquharson, of Exeter, had pleaded guilty to sending an indecent or grossly offensive message. Farquharson, who suffers from mental health issues, was accompanied by his carer when he returned to court to be sentenced. The judge heard that Farquharson had autism and a difficult upbringing. Rob Jacobs, defending, said Farquharson’s “anger and annoyance” had been building up at what he saw as “concerns for others” and he had “lost his temper”. Jacobs said: “Mr Farquharson is both very vulnerable and probably a very lonely individual. I don’t think he would mind me saying that that he has too much time to think and ruminate on his political views. It is true that his political views are strongly held. Last week, Bradshaw said the abuse dished out to politicians on social media had got worse since the death of Cox. He told the BBC’s Victoria Derbyshire show he believed it was now “socially acceptable” to use Facebook and Twitter to abuse politicians and he hoped the killing would lead to a “deeper reflection” about the political culture in the UK.